The StickMonkey says, Not so fast! 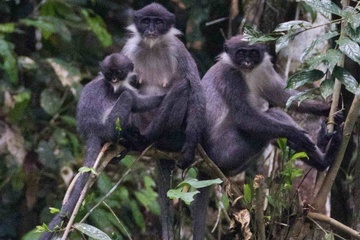 The Miller’s Grizzled Langur isn’t extinct, after all, just chilling down in the Wehea Forest on the eastern tip of Malaysia’s Borneo Island – which is just off east coast in the Celebes Sea. Scientists had set up some camera traps to snag photos of clouded leopards, orangutans and other wildlife known to congregate at several mineral salt licks there on the island. Doink! They also ended up with photos of Miller’s Grizzled Langurs. A search for them on Borneo, as well as the islands of Sumatra and Java and the Thai-Malay peninsula, had turned up empty-handed in the middle of this decade, and so it was generally believed that the monkey had lost out to agricultural mining in the area. They were also hunted because bezoar stones – which are thought to neutralize poison were sometimes found in their guts. It would be nice to think that now they’ve been found, and we know they’re still around, we went out of our way to help them stay around. Monkeys are good people. Even ones that have this funky Dracula thing going on with the white collar of fur around their necks. Welcome back to the land of the living, my furry friends.